The bright stars Altair, Deneb, and Vega form a prominent triangle that is well seen on August evenings from all but the most southerly latitudes. In the northern hemisphere, it is known as the Summer Triangle. Another major site for northern observers is the Perseid meteor shower, visible in mid-month. Sagittarius is a constellation of the zodiac that lies between Scorpius and Capricornus. It depicts Crotus, the son of the Greek god Pan and the inventor of archery, aiming his bow at a scorpion, represented by the neighboring constellation Scorpius. The center of our galaxy lies in the same direction as Sagittarius, and binoculars show that the star fields in this part of the Milky Way are particularly dense. The Sun passes through Sagittarius from December the 18th to January the 19th, a period that includes the December( Winter) solstice. The constellations brightest star is Epsilon Sagittarii, magnitude 1.8. A group of eight stars: Gamma, Epsilon, Delta, Lambda, Phi, Zeta, Sigma, and Tau Sagittarii. Together, they form the outline of a teapot, with a pointed lid and a large spout. The stars Lambda, Phi, Zeta, Sigma, and Tau Sagittarii also form a shape known as the Milk Dipper, so named because it lies in a rich area of the Milky Way. A multiple star, although all the components lie at different distances and are unrelated. The naked eye shows it is a wide double with components of magnitudes 4.0 and 4.3. The brighter star, Beta-1, has a 7th-magnitude companion that can be seen through a small telescope. A bright nebula visible to the naked eye and a good target for binoculars. Elongated in shape, it is almost 3 times the apparent width of the full Moon. A dark lane of dust bisects it: one half contains the cluster NGC 6530 with stars of 7th magnitude and fainter, while the most prominent object in the other half is the 6th-magnitude star 9 Sagittarii. The nebula, and the stars within it, are 5,200 light-years away. A cloud of glowing gas of similar apparent size to the full Moon. It can be seen with binoculars, although a telescope is needed to see its true shape. A small telescope shows a star cluster, NGC 6618, within the cloud. The nebula and the cluster both lie about 4,900 light-years away. A nebula with a faint double star at its center, both visible with a small telescope. Larger apertures and photographs show dust lanes trisecting the nebula. The third brightest globular cluster in the sky, 10,000 light-years away. It is just visible to the naked eye under good conditions and easy to find with binoculars, which show it is a rounded patch about two-thirds the apparent size of the full Moon. A telescope of moderate aperture resolves it brightest star. A rich open cluster, elongated in shape and almost the same apparent width as the full Moon. It can be seen with binoculars, while a small telescope resolves its stars. It lies 2,100 light-years away. 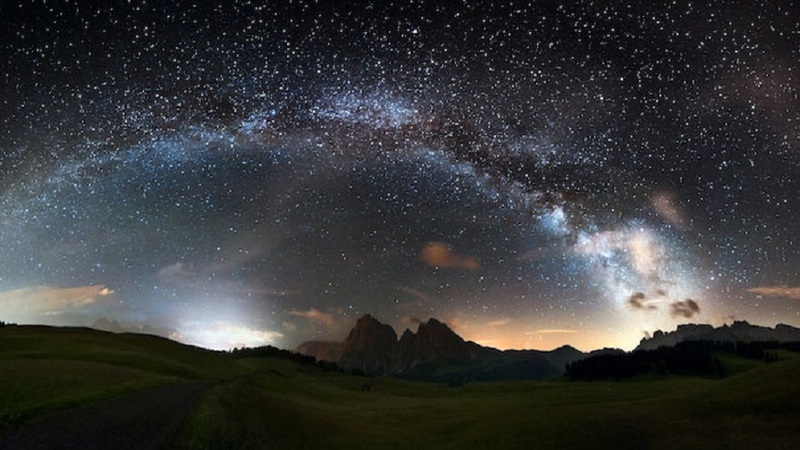 A large and bright field of stars in the Milky Way, visible to the naked eye and an excellent sight through binoculars. A small telescope reveals a small open cluster. NGC 6603, within it. An open cluster just visible to the naked eye and a good object for observation with binoculars or a small telescope. Its stars, of 7th magnitude and fainter, are scattered over an area of the sky the same apparent size as the full Moon. It lies 2,000 light-years away. This star, also known as Beta Cygni, is one of the most celebrated doubles in the sky, on account of the collaboration of its component stars and the ease with which they may be separated. The smallest of telescopes will show the stars; they appear amber and greenish, like two lamps in a celestial traffic light. This dark nebula, also known as the Northern Coalsack, divides the Milky Way into two. It can be traced with the naked eye from Cygnus, through Aquila, and into Ophiuchus, where it broadens out. Three stars in three separate constellations form a large isosceles triangle, which is a familiar feature in skies of northern summer and fall, and southern winter and spring. The brightest of the three is Vega in Lyra, followed by Altair in Aquila, and Deneb in Cygnus. The Cygnus Rift runs through the triangle.